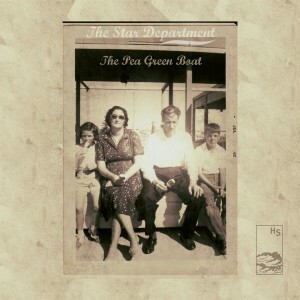 Hidden Shoal is proud to announce the release of ‘Stitches and Sleeves’ by atmospheric indie-pop duo The Star Department, the second single from their debut album The Pea Green Boat, released on 7th July 2015. ‘Stitches and Sleeves’ is bound together by a heartbreaking guitar line, a silvery waltz-time figure that sends shivers up the spine. Combined with shuffling drums, a muted yet ominous horn section, and Justin Commins’ vulnerable, almost defeated vocal, the song radiates melancholic pop magic. The Star Department – multi-instrumentalists Justin Commins (Kill Krinkle Club) and Michael Orange (Feather Beds, Soft Bones) – formed in Dublin in 2006. ‘Stitches and Sleeves’ is taken from The Star Department’s forthcoming debut album The Pea Green Boat (7th July 2015) which charts a beguiling journey through gently psychedelic waters. Production credits for the album include David Brewis of Field Music, and Tom McFall (Bloc Party, REM, Stars, Weezer). Download ‘Stitches and Sleeves” at BandCamp and stream the track at SoundCloud.